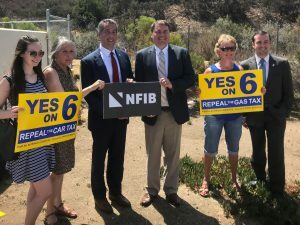 SAN DIEGO, Calif., July 11, 2018 –Today NFIB formally endorsed the Yes on Proposition 6 campaign to repeal the recent gas and car tax increases. 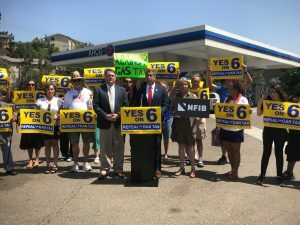 NFIB members, staff, and grassroots leaders gathered at an ARCO gas station in San Diego, CA to announce California’s leading and largest small business association supports Proposition 6, which will appear before voters statewide on the November 6 ballot. KUSI News were among multiple media outlets present; video coverage can be viewed HERE. “We are here today to accept a very important endorsement for the Yes on Prop 6 campaign from the National Federation of Independent Business (NFIB). This is the voice of the small business owner in the State of California and across the country. They are breaking ranks with Governor Jerry Brown who has gone to other business groups to curry favors, but not NFIB; NFIB stands on principle. They know that higher taxes hurt small businesses, higher taxes hurt California consumers. The cost of living in California has reached a crisis point, and it’s only getting worse; that’s why we stand for Yes on Prop 6 to repeal the car and gas tax hikes,” stated Carl DeMaio, Chairman of the Yes on Prop 6 campaign as he kicked off the press conference. “California small businesses and working families are being crushed in this state with rising costs in every aspect of running their business, which is why NFIB was the leading statewide business association opposed to Senate Bill 1 last year, and why we fully support Proposition 6 to repeal these regressive gas and car tax increases on hardworking Californians. Business owners deeply understand the need for a vibrant transportation infrastructure, and they also know Sacramento has mismanaged existing transportation tax revenues for decades which has resulted in abysmal roads across California. However, with a $200+ billion state budget with a $9 billion surplus, clearly higher taxes are not needed—better management of our tax dollars is the answer, and Proposition 6 forces the legislature to be accountable with existing transportation tax dollars,” remarked NFIB’s California State Director John Kabateck, to a crowd of ~40 grassroots leaders and multiple media outlets. “In the last 10 years, I’ve seen too many people leaving or planning to leave California because it just plain costs too much to live here. And it seems like every election includes lots of proposals that add to our tax burden, or increase the cost of doing business, particularly for small businesses like mine…We need to pass Prop 6 to repeal the gas and car tax hikes and stop California’s race to the bottom in the list business-friendly states,” added Ann Kinner, NFIB member and owner of Seabreeze Nautical Books & Charts (Point Loma). NFIB is the voice of small business, advocating on behalf of America’s small and independent business owners, both in Washington, D.C., and in all 50 state capitals. NFIB is nonprofit, nonpartisan, and member-driven. Since our founding in 1943, NFIB has been exclusively dedicated to small and independent businesses and remains so today. For more information, please visit www.nfib.com/CA.